If you are short on money and space but still want to be organized, then a ladder shelf might be a good idea for you (Source). Most of the bookcases we examined have five shelves. While you cannot use them as an actual ladder, these decorative shelves are perfect for storing your special books and keepsake collections, as long as they weigh usually no more than 20 pounds per shelf (Source). Want to think outside the box? Use these leaning bookcases outside your library. Or take them into the kitchen to display dainty dishes or to the bathroom for towels and essentials (Source). The Casual Home Bookcase features genuine wood, a material scarcely used by other shelving units. Its only drawback is some buyers have complained the color is less dark espresso and more cherry red, a complaint mentioned on more than one product on the list. T﻿he Ollieroo is the only other bookshelf made from natural materials: the solid bamboo makes it a sturdier choice than composite wood, but bamboo is still thin and cannot hold more than 22 lbs. per shelf. Even so, buyers rave that is easy to assemble and love the fact that it is made from natural materials. If you are willing to buy a shelf made from synthetic material, the eHemco 5 Tier Bookcase Shelf Ladder comes in a variety of colors, including black, white, and grey. The black shelves of the Convenience Concepts American Heritage Bookshelf Ladder adds a nice modern finish to a room, but some buyers give it mixed reviews. Some say that while it's a value buy, they note that it is flimsy, sometimes shipped with missing screws, sometimes has incorrectly drilled holes, and that the color was somewhat different in the product photo. 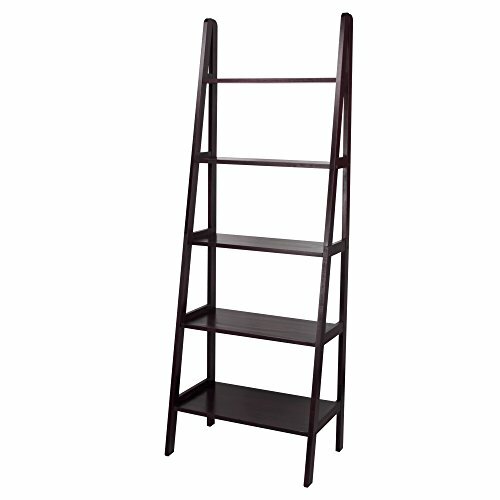 Another bookcase is the eHome Products Leaning Ladder Wall Bookshelf. Like with other shelves, buyers complain that the color isn't quite true to form- more red than brown. But the raised edges ease the struggle of the contents falling off the shelves. If you are looking for a top-rated ladder bookcase, you might want to consider this 5-shelf model offered by Casual Home. Users love the stylishness of this bookshelf, but some do complain about receiving a defective item. This product is made of 100% solid wood, which can be wiped easily with a damp cloth. It features a contemporary styling and a simple assembly. You can choose between three colors: brown, espresso and white. This item seems like a good choice if you want a classy but modern shelf for most decor needs. The general user consensus concerning the Casual Home modern ladder bookcase is that it is sturdy and well made, as well as that it provides lots of shelf space. They add that the assembly is very easy. However, many buyers complain about receiving a defective item or a product with missing parts (e.g. screws). A frequent complaint is that the actual color differs from the one shown in the picture (it is more cherry than espresso). This 5-tier bookshelf offered by eHemco is a solid option for those who want a ladder bookcase.Users like the design of this piece of furniture, but do complain about its sturdiness and functionality as a bookshelf. This product has 5 shelves with 20″ width and it has 3 side-raised lips (2″high). The product features a third leg under the biggest tray for extra support. It also has a screw on the top tray which can be connected to the wall for preventing the shelf from moving. The item is available in two colors: black and grey. This ladder bookshelf might be a solid choice if you are looking for a piece of furniture that has lots of room for displaying items of varying heights. In general, users have a favorable opinion of the eHemco 5-tier bookshelf.What they praise is that it is easy to put together and that it looks nice and stylish. However, many buyers express complaints regarding its flimsiness. 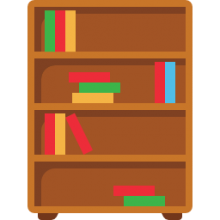 As one online reviewer states, it is not very functional as a bookshelf because it is not sturdy enough to hold many books. This contemporary 5-tier leaning bookshelf offered by eHome Products is a solid option if you want to keep your books, CDs, photos, collectibles and decorations neatly organized. Users like the quality-price ratio, but do complain about the hard assembly and certain design drawbacks. This product features a solid wood construction and raised lip on shelves to prevent items from slipping off back or sides. It comes in a contemporary cappuccino finish. 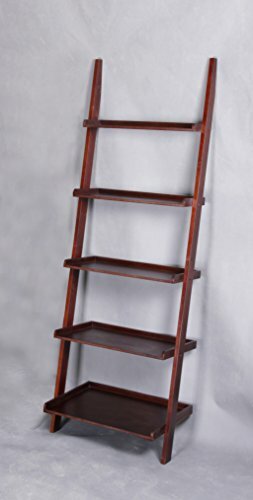 Its overall dimensions are: 72 inches high x 25 inches wide x 17 inches deep.If you want a stylish ladder bookcase, this might be a solid option. In general, users have a favorable opinion of the eHome Products ladder bookcase and they agree that it is made of good quality material for the price. Many of them state that it is very functional, sturdy and looks very stylish. However, some purchasers complain about the hard assembly. Others complain about their item arriving with one shelf broken. One dissatisfied buyer complains about the two-piece vertical side rails which don’t fit together very well, leaving the joints a bit uneven. This multi functional storage rack offered by Ollieroo is a solid option for those looking for a ladder bookcase.Users like its design, but some complain about minor defects. This product features a solid natural bamboo construction. It has 4 spacious and smooth surfaces for holding plenty of items for storage or display. This stylish bookshelf has an extra wide base which is great because it provides additional stability. This item could be a solid choice if you’re looking for a bamboo bookshelf with a contemporary, geometric pattern. 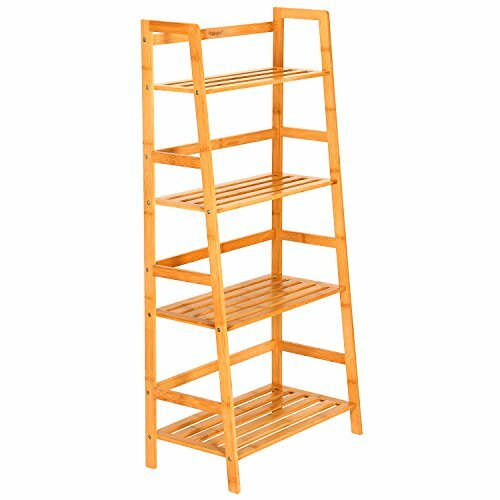 In general, buyers have a positive opinion of the Ollieroo bamboo ladder bookcase. They state that it is a great light duty bookcase, solid, sturdy and easy to put together. They agree that it has lovely color and texture. However,some buyers complain about it not being very well made, stating that it came with minor defects. If you are looking for a ladder bookcase with clean lines, you might want to consider this one offered by Convenience Concepts. Users like its design, but have complaints about the quality. This product features clean lines and attractive black woodgrain veneer, making it a piece of furniture that fits easy with any decor. It can be a great fit for a home office, living room or even a bathroom. You can pick your favorite color (combination): black, cherry, cherry and black or espresso. If you are looking for an affordable bookshelf,this might be a solid option. 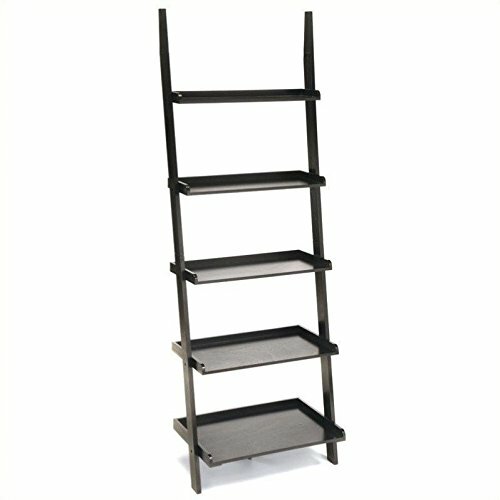 In general, users are happy with the Convenience Concepts ladder bookcase. What they like in particular is that it is sturdy and that it looks great. They agree that it is a good product for the price. However, some purchasers complain about cheap quality materials. One buyer advises being careful how you lean it against the wall. He suggests not overloading it, emphasizing that it is strictly for knick knacks, medium sized books and such. Another one states that all the shelves on his item became tilted and wobbly after a few months.